Rethinking Reality: What kind of year is 2015 going to be numerology speeking? What kind of year is 2015 going to be numerology speeking? Numerology is based on the teachings of Pythagoras. Really. That same guy from Algebra and Geometry class was the leader of a mystic movement. They don't teach that in high school math class or I might have paid more attention. 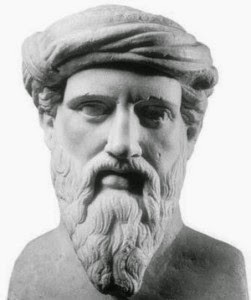 Pythagoras was a Greek philosopher who was born around 571 BC in Samos, Greece. He developed a philosophy based on mathematics. He postulated that everything in the universe was based on numbers. He didn't write anything down so not too much survived. He believed that if one devoted one's life to the study of math and science can relieve one from the Wheel of Birth - i.e. successive reincarnations. Certain types of numerology was derived from his teachings. In Numerology to determine what kind of year it's going to be we add the numbers of the year - 2+0+1+5=8. So 2015 is a year of 8. Eight relates to wealth, abundance and prosperity. Also inner wisdom and self-sufficiency. Of course with the positive there is always a shadow side. The shadow side of 8 is domineering, greedy and smug superiority. With Eight there is no half-way - it's either limitation or freedom, leader or burnout. Eight sees the big picture and has a strong driving force to achieve goals. Eight has a large capacity for hard work and drive to succeed. Next time, I'll talk about how a Personal Year interacts with the Eight.